We've made it through another rite of passage...Homecoming. Here in Texas, for those of you not in the Lone Star State, the girls wear mums and the boys wear mini mums on their arms called garters. 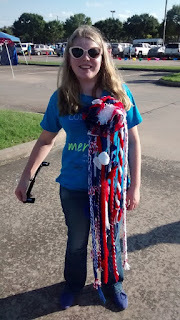 These oversized corsages consist of silk flower mums (typically white ones but sometimes they are school colors) on a ruffled backing with streamers of ribbons, lace, and dangling plastic and metal adornments like mascots, bells, etc. all attached by masses and masses of hot glue. Diva was content to not have a mum, as she is a fairly contented child, but as her Momma, I felt like she needed to have one. It was probably because she is in her first year of high school. Or maybe it was because she has had to start high school while living in a hotel. Possibly it was because she has been moved away from schools and homes that she loved twice in two years. Most likely, it was because of all of the above. I have not a crafty bone in my body and as for wielding a glue gun? Fuhghedaboudit! I struggled with what to do; I felt like I should get her a mum and I was running out of time. Nothing in the Moppins household gets done in a "normal" way and yet my only option was looking like going to a chain store to find a pre-made run-of-the-mill mum. What I am capable of are very simple knitting projects and crocheting pathetic chains. I never said I was a perfectionist. Thus, the knitted mum was created...and it suits her. Diva is a knitter, a much better one than I am I might add, and she was thrilled. 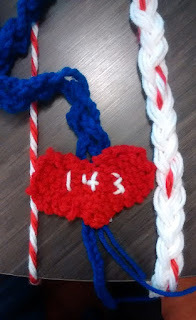 Her one request was that she could have a "special ribbon"- one that was unique to her...as if a knitted mum was not already unique enough. Her request was granted. A one of a kind ribbon in a one of a kind mum for a one of a kind girl. ... such a GOOD mama! Thank you Ms. Linda. Sometimes we just need to hear that. What a fun school tradition, and what a sweet mama! Thanks! It is a neat tradition.